Singapore-based Banyan Tree Group has announced the launch of the world’s first Cassia Residences on Phuket, located steps from serene Bang Tao – Phuket’s premier west coast bay with a wide sandy shoreline. Cassia Residences Phuket, the latest phase of the Cassia Phuket Development to be sold as freehold is situated by a lagoon in the heart of the 1,000-acre Laguna Phuket – Asia’s finest integrated resort and home to an 18-hole golf course, award-winning spas, watersport facilities, a boutique shopping village and more than 30 bars and restaurants. 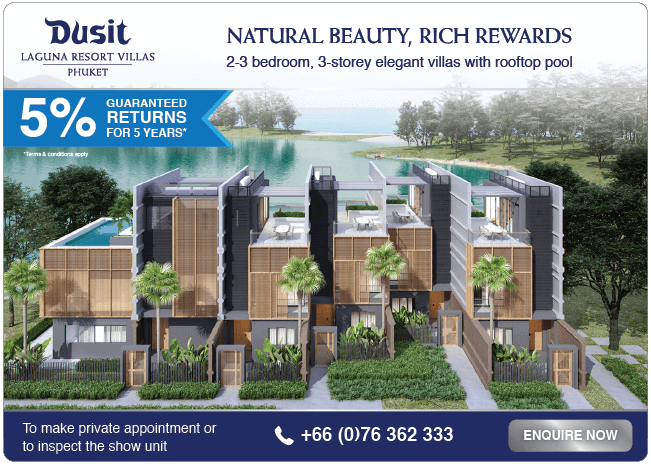 Cassia Residences is the only condominium project inside Laguna Phuket, set amid lush tropical greenery just a 25-minute drive from Phuket International Airport. A total of 193 units are housed in the community's low-rise buildings, each one set around a tropical lagoon and crowned with a rooftop pool that's exclusive to residents. Designed with comfort and livability in mind, the units at Cassia Residences Phuket are styled to serve the needs of the modern homeowner. Apartments come in two-bedroom (75 sqm) and three-bedroom (119 sqm) configurations, nestled in two separate buildings, and feature lounge and dining areas that seamlessly flow into one another to form a single, open-plan integrated space. Whether it is a homely sanctuary within a growing residential community, or a holiday retreat away from the stresses of daily life, Laguna Phuket offers something for everyone with multiple opportunities for relaxation, romance, fun and exploration. Complimentary shuttle bus and boat services invite homeowners to enjoy the benefits of living in an integrated resort complex. Start the day with a morning jog on the beach. Celebrate a special anniversary, or a business success at any of Laguna Phuket’s 30 restaurants and bars. Welcome the weekend with a round on the championship greens at “Asia’s Best Golf Course”, or make a date with natural adventure as you take to the waters and engage in one of the myriad watersports available. Wellness seekers can embark on a rejuvenating journey at one of Laguna Phuket’s sumptuous spas. At the end of an inspiring day, owners and guests can rest assured that the highest standards of service and security are in place to guarantee peace of mind for the whole family. Backed by the know-how of multi-award winning Banyan Tree Group, Cassia Residences Phuket combines the convenience of a resort lifestyle with all the comforts of a modern home, while placing nature on your doorstep. To get a feel for this idyllic lifestyle, interested buyers are invited to visit a two-bedroom show unit at the Laguna Lifestyle Hub inside Laguna Phuket. For more information, or to arrange a private inspection please contact at +66 (0) 076 362 333 or email us at [email protected]. Singapore-based Banyan Tree Group is introducing two of its beachfront residences to Hong Kong investors at a property showcase on the weekend of November 4 – 5, 2017.